iSpyConnect supports live feeds from both cameras and microphones. Live video is available through iSpyConnect in a variety of resolutions. 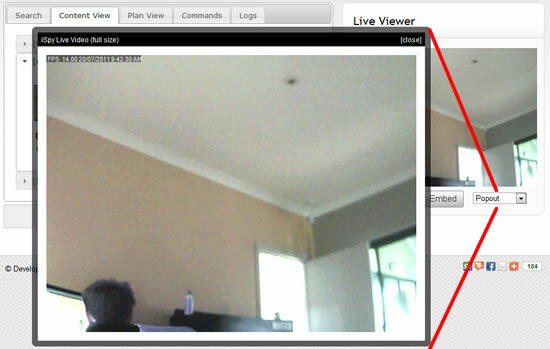 The "Live Viewer" on the right displays a live feed from your camera at 320 x 240px. You can select a different resolution for the live feed from the drop-down underneath - any size up to the native size of your camera. When you choose a different resolution the video feed pops up in a bigger (or smaller) window. 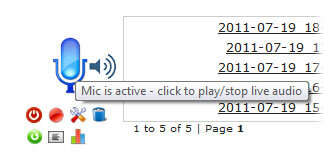 Click on the microphone icon (for a microphone source) to play live audio through the web browser. There may be a short delay between clicking the icon and hearing the audio (whilst it buffers). Where IPADDRESS is the IP address of the computer running ispy and CAM_ID is the ID of the camera you want a feed from (you can find the ID by clicking "Edit" on the camera - it will be displayed in the title bar of the form).